Sorbie Tower and its grounds are open all year round, and an open day is held on the Sunday after the annual clan gathering in May. Over the years there have been many school visits, historical tours, re-enactments, weddings and open days with ceilidh bands, dancing and piping. Information boards have been installed and camping facilities are being improved. 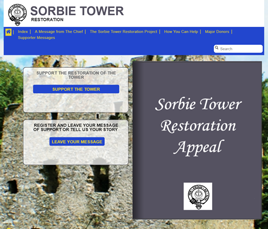 The end goal is the full restoration of Sorbie Tower. This will enable it to be used for holiday lets, which will provide an income to maintain the existing facilities for the public benefit. Since the organisation is registered with the Scottish Charity Regulator, your donation may be eligible for a tax benefit if you pay taxes in the United Kingdom. Please check with your accountant or tax advisor. If your donation is eligible for Gift Aid, you can download the relevant form confirming your amount and UK residency here. If you are a U.S. taxpayer, your donation may be eligible for a tax benefit, but you must contribute through the American Scottish Foundation, our nonprofit sponsor in the United States. Click here for instructions. Once printed and completed, you will need to send by post or scan and email to the society (contact information is on the form). US Donations are processed through the American Scottish Federation and may be eligible for a tax benefit if you are a resident of the United States. UK Donations are processed through PayPal and may be eligible for a tax benefit if you are a resident of the United Kingdom.